At GitHub, we’re building the text editor we’ve always wanted. A tool you can customize to do anything, but also use productively on the first day without ever touching a config file. Atom is modern, approachable, and hackable to the core. We can’t wait to see what you build with it. You can also try the latest beta for Atom here. Node.js support makes it trivial to access the file system, spawn subprocesses, and even start servers directly from within your editor. Need a library? Choose from over 50 thousand in Node’s package repository. Need to call into C or C++? That’s possible, too. Atom is composed of over 50 open-source packages that integrate around a minimal core. Our goal is a deeply extensible system that blurs the distinction between “user” and “developer”. Don’t like some part of Atom? Replace it with your own package, then upload it to the central repository on atom.io so everyone else can use it too. When only a file is specified, don’t open and index the parent directory. Fixes for Windows and macOS auto-update behavior. When using the default Jasmine test runner, a temporary directory is used for ATOM_HOME so that other packages can’t interfere with unrelated tests. Set APM_TEST_PACKAGES to explicitly depend on tests. find-and-replace: Pane items may implement getEmbeddedTextEditors() or observeEmbeddedTextEditorto allow find-and-replace to search within internal TextEditors. github: Pull request review comments are included in the “Files Changed” tab of a pull request detail item. github: git’s core.commentChar setting is respected during commit message preprocessing. github: Large diffs are collapsed by default, and any file patch within a commit preview or commit detail item can be collapsed and expanded. language-ruby: Correct syntax highlighting issues for floats and some integer types. 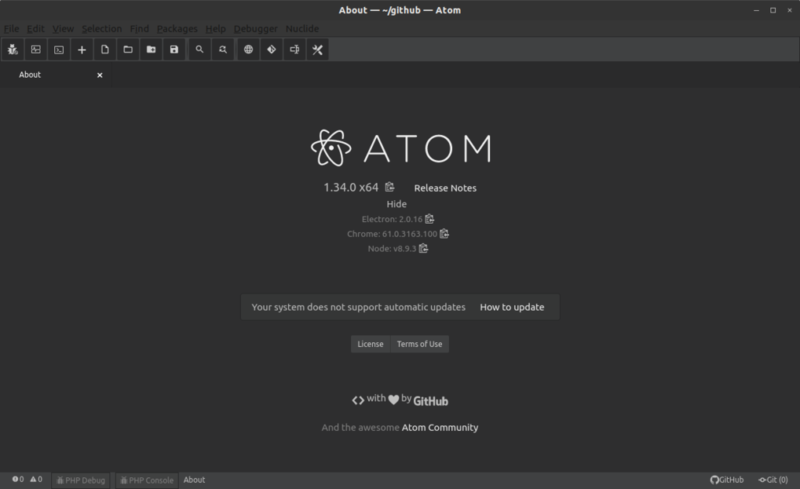 To customize Atom you should check out the packages available here.